Marx’s aim was to provide a handbook for working-class activists that unravelled the logic of capital and its inherently exploitative nature. Marx said this was necessary because as long as workers did not understand that capital was the result of their exploitation, they would not be able to defeat their enemy. Michael Lebowitz’s latest book, The Socialist Alternative: Real Human Development says it is essential also to investigate the important insights Marx made regarding the alternative. This easily accessible book is written to provide young and working-class socialist militants a weapon in their struggle for a better world. It is hard to agree more with Bill Fletcher Jr., when he says this book “should be the focus of discussion groups of activists as they attempt to unite their radical practice with theorising a radical, democratic and Marxist alternative for the future”. Lebowitz rejects the old saying that “if we don’t know where we want to go, any path will take us there.” Rather, if you don’t know where you are going, no path will lead you there. Lebowitz says: “The purpose of this book is to point to an alternative path” focused on the “full development of human potential”. Pulling together the different threads in Marx’s various sketches on socialism, and drawing on his own personal experiences and studies on “real existing socialism,” social democracy, and most importantly, Venezuela’s struggle for a new socialism for the 21st century, The Socialist Alternative aims to “develop a general vision of socialism and concrete directions for struggle”. Lebowitz’s idea of socialism breaks from the dominant vision that prioritises “the development of productive forces” that, supposedly, will one day provide abundance and “allow everyone to consume and consume in accordance with their needs”. Instead, he places humans at the centre of its focus. 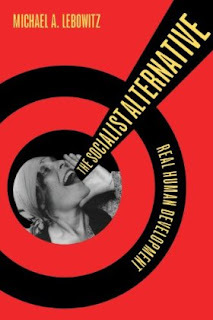 The book does not set out to be about the Bolivarian process in Venezuela — Lebowitz has lived in Venezuela since 2004 — but many of the ideas in it will be familiar to those acquainted with the ideas being debated today within a mass movement where the idea of socialism has gripped the mind of the masses and converted itself into a material force for change. The idea that self-emancipation and struggle are the keys to changing the world and people is essential to Lebowitz’s argument. Citing Friedrich Engels, Lebowitz maintains that the aim of communists is “to organise society in such a way that every member of it can develop and use all his capacities and powers in complete freedom and without thereby infringing the basic condition of this society”. The only way to do so is through “revolutionary practice” because human development is not a gift given from on high. Marx explained that revolutionary struggle produces a simultaneous “changing of circumstances and of human activity or self-change". Put another way, “without the protagonism that transforms people, you cannot produce the people who belong in the good society … and understand that the development of the human capacities on the one side [cannot be] based on the restriction of development on the other”. Capitalism offers no alternative in this regard. Rather, it is a system based on a “vicious cycle”. People have real needs but do not possess the means to satisfy them. They are therefore forced to work for those that do (capitalists) and compete against others in repetitive labour, so as to be able to buy at least some of the products they need. This vicious cycle never stops under capitalism. Capital requires workers to see the cycle as a “normal” part of life. “The advance of capitalist production develops a working class which by education, tradition and habit looks upon the requirement of that mode of production as self-evident natural laws”, wrote Marx in Capital. 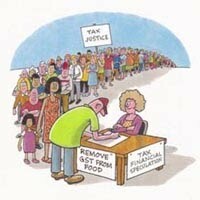 Today however, capital is haunted by the spectre of “socialism for the 21st century”. Drawing on Venezuelan President Hugo Chavez and what he calls “the elementary triangle of socialism” — social ownership of the means of production, social production organised by workers, and production for communal needs — Lebowitz outlines what is at the heart of this radical alternative for the 21st century. Private ownership of the means of production must be replaced with social ownership of the products of social heritage and social labour as the “only way to ensure that these are used in the interests of society and not for private gain”. But social and state ownership are not the same. A real socialist alternative requires a “profound democracy from below rather than decisions by a state that stands over and above society”, where all workers are able to develop their human capacities. Critical to this is the second side of the triangle: social production. In opposition to the command-and-obey workplace, a socialist alternative must be based on the replacement of the division of labour between those that think (intellectual labour) and those that do (manual labour). This artificial division can best be overcome with collective democratic decision-making in the workplace. To complete the triangle of social ownership and worker management, Lebowitz says productive activity must be geared towards the needs of others. That is, the creation of a society based on solidarity, where there is an exchange “not of exchange values but ‘of activities, determined by communal needs and communal purposes’”. Here again, Lebowitz puts stress on revolutionary practice. He says the impulse for the development of socialism must be the drive of workers for their own human development. Workers need not only “seize possession of production” to introduce worker management and communal production. They also need to “seize possession of the state” and conquer political power. From this position of power, “the proletariat will use its political supremacy to wrest, by degrees, all capital from the bourgeoisie, to centralise all instruments of production in the hands of the state”. The experience of the Paris Commune convinced Marx and Engels workers could not use the ready existing state for its own purposes; rather it had to be smashed and replaced by a new state of “self-working and self-governing communes”. So the struggle for a socialist transformation must unfold on two fronts: within the state that owns the means of production, and in the workplaces. But the struggle also unfolds within the context of an emerging new society that is, said Marx, “economically, morally and intellectually, still stamped with the birthmarks of the old [capitalist] society from whose womb it emerges”. For the struggle to succeed, it is vital to fight consciously against the “defects” inherited from the old society and subordinate — rather than try to use — these defects to one’s ends. Lebowitz is opposed to a vision of socialism that suggests it must pass through distinct stages, where priority is first given to developing the productive forces to create a world of abundance, and says this was not Marx’s view. Chapter six, “Making a path to socialism”, offers a kind of transitional program for socialism in the 21st century. Lebowitz’s starting point is that the transition towards socialism must move forward simultaneously on all three fronts of the socialist triangle. He says every concrete measure must serve to change circumstances while helping to produce revolutionary subjects and raise their capacities. “Only in a revolution”, wrote Marx and Engels, can the working class “succeed in ridding itself of all the muck of ages and become fitted to found society anew”. Threats to this revolutionary process are always present from counter-revolutionary capitalist elements, the tendency of bureaucrats to “seize production” for themselves and the tendency to rely on the market to resolve problems. To combat this, a “socialist mode of regulation” is essential to allow socialism to subordinate all elements of society to itself, and create the organs it still lacks. This encompasses an ideological struggle against capitalism and for socialism (“The Battle of Ideas”); the creation of worker and community councils where people can organise to change their circumstances and themselves at the same time; and “a state that supports this struggle ideologically, economically, and militarily and thus serves as the midwife for the birth of the new society”. At this point, Lebowitz asks a central question: “What do we mean by the state? “We have to talk about two states here — one, the state that workers captured at the outset and that initiates despotic inroads upon capital, that is, the old state; and, second, the emerging new state based upon workers councils and neighbourhood councils as its cells. “The two must coexist and interact throughout this process of becoming. “Yet”, Lebowitz argues adamantly, “that tension is not the principle contradiction”. Given the presence of revolutionaries in the old state, it would be an error to act as if it was the same as the capitalist state. Similarly, it would be a mistake to ignore the vices of the old society present in the embryonic forms of the new state. The struggle against bureaucrats seeking to defend their privileges or ideological inertia will unfold within both states. At the same time, Lebowitz says, “interaction between the two states is essential”. The old state has the advantage of being able to see the picture as a whole and concentrate forces, but it also has a tendency to act from above and prioritise expediency over revolutionary practice. The new organs can identify “the needs and capacities of people and can mobilise people to link those needs and capacities directly”. But there is also a tendency towards localism and the new emerging state “is not capable at the outset of making essential decisions that require concentration and coordination of forces”. Critical to all this is a political instrument — or political party — that can provide leadership. This is needed because a society marked by the vices of the old cannot produce a process where all workers become socialists at the same time. 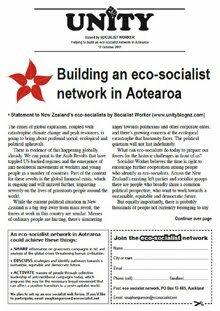 The Socialist Alternative is an inspiring and insightful contribution to the discussion of rebuilding the socialist project in light of past failures and the current challenges facing anti-capitalist activists everywhere. 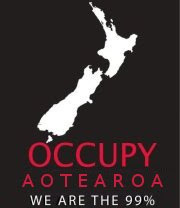 No doubt here in Australia, in the context of the resources boom and the growing environmental crisis, the ideas raised in the book regarding social ownership and the need to struggle for transparency – “open the books” – will provide much food for thought for ecosocialists in the battles that lie ahead of us.